Background and Objective: There were studies in the literature which showed the altered dermatoglyphics in the cleft children. But it would be beneficial if probable expression can be proved in prior generations, so that genetic counseling and other preventive measures can be undertaken. The aim of the study is to determine variations in dermatoglyphics of prior generations which would serve as bench markers to predict the occurrence of cleft in off springs. Materials and Methods: A total of 400 parents aged between 25-45 years were selected and divided into two groups - Group A consisted of parents with cleft children and Group B comprised of parents with at least 2 healthy children who met the inclusion criteria. Dermatoglyphic prints were collected by ink method and evaluated for pattern types, total ridge count and palm prints were evaluated for a-b ridge count, atd angle and asymmetry. Results: Significant difference was observed between Group A and B with reference to pattern types; TRC and a-b ridge count and atd angle. Absence of t point was variably noticed in the mothers of affected children. Conclusion: Dermatoglyphics can be used as tool to study the developmental instability of cleft anomalies and provides data to assess the genetic etiology of clefting. The term dermatoglyphics is derived from the Greek word Derma – Skin and Glyphic – Carving, coined by Cummin and Midlo in 1926. It is an established fact that no two individuals, including monozygotic twins, have the same fingerprints and other details of dermal ridges. 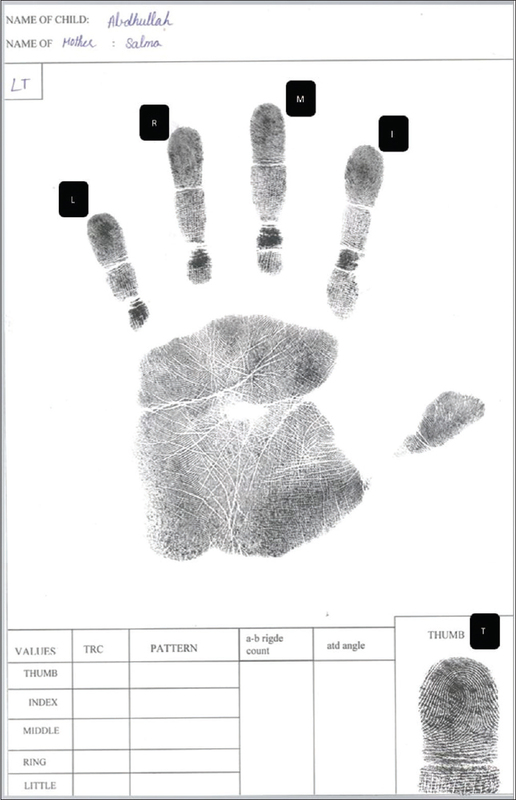 Thus, fingerprints are unique to each person and they are not altered during lifetime due to disease, age, or any reason. Owing to these facts, dermatoglyphics has been a useful tool in understanding basic questions in biology, medicine, genetics, and evolution, and it is the best and most widely used method of personal identification over the past 150 years. The widespread medical interest on epidermal ridges has clearly witnessed the association between chromosomal aberrations and unusual dermal ridge presentations. Craniofacial disorders and syndromes known to be associated with gross variation in dermatoglyphic pattern presentation, asymmetry and unusual expression of patterns such as dermal ridges, and craniofacial structures take their origin from fetal volar pads and develop from embryonic ectoderm. Morphogenesis of dermatoglyphic structures and organogenesis coincide with each other in time period and programmed with genetic expressions which are interrelated. Investigations suggest that both the dermal patterns and craniofacial organs are genetically governed structures yet influenced by intrauterine environment. Affliction of anyone of these will adversely affect the other. Nonsyndromic cleft lip and/or palate (NSCL/P) is a relatively common condition among the world's population, occurring 1 in 700–2000 live births and the etiology of such clefts is complex where interplay between genes and environment would contribute to the development of cleft. Some clefts are of nongenetic origin and their occurrence cannot be determined with genetic analysis. Some individuals have increased genetic liability for having a child with CL/P often fail to be recognized, as they do not have CL/P for themselves. This happens because incomplete penetrance and variable gene expressivity, but this developmental instability (DI) would have autosomal dominant inheritance pattern and manifests itself as cleft in their offspring's., Phenotypically, such DI may manifest through abnormal dermatoglyphic pattern presentation. The correlation between cleft and dermatoglyphic alterations in the affected has been clearly demonstrated in the literature, this only gives insight into the association between craniofacial anomalies and dermatoglyphics, thus this is not helping us to predict the future probable occurrence of cleft. But in the literature, it has been clearly validated that in the instances of NSCL/P of genetic origin, the tendency for clefting starts in the previous generations itself. The phenomenon of incomplete genetic penetration most often associated with genetic NSCL/P is responsible for its nonoccurrence. This incomplete genetic penetration may phenotypically exhibit some alterations in dermal patterns. Hence, this particular study was planned to determine the degree of DI which had been phenotypically expressed in the parents as dermatoglyphic variation. This may help in predicting the future risk of cleft in genetic NSCL/P cases. Thus, this is an attempt to determine the usefulness of dermatoglyphics in studying the genetic etiology of CL/P. In the present study, a total of 400 healthy individuals, that is, 200 couples (200 mothers and 200 fathers) aged between 25 and 45 years were included. They were divided into two groups based on the presence or absence of cleft in their offsprings. Group A – 100 couple were the study sample (Group AM100 mothers and Group AF100 fathers) having one or more cleft children and Group B – 100 couple were the controls (Group BM100 mothers and Group BF100 fathers) with at least two healthy children. Individuals with congenital and acquired deformities of fingers and palms, any congenital malformations, skin diseases, history of maternal problems or diseases during pregnancy, and family history revealing cleft in the previous generations were excluded from the study. Sample selection and obtaining dermatoglyphic data were accomplished during January 2015–June 2016. Group A sample was selected from various cleft rehabilitation institutes. Group B sample was selected from outpatient block, department of pedodontics and preventive dentistry. Before starting up the study, permissions were obtained from selected institutional heads to carry out the procedure. Before the sample collection, informed written consent was obtained from the participants. 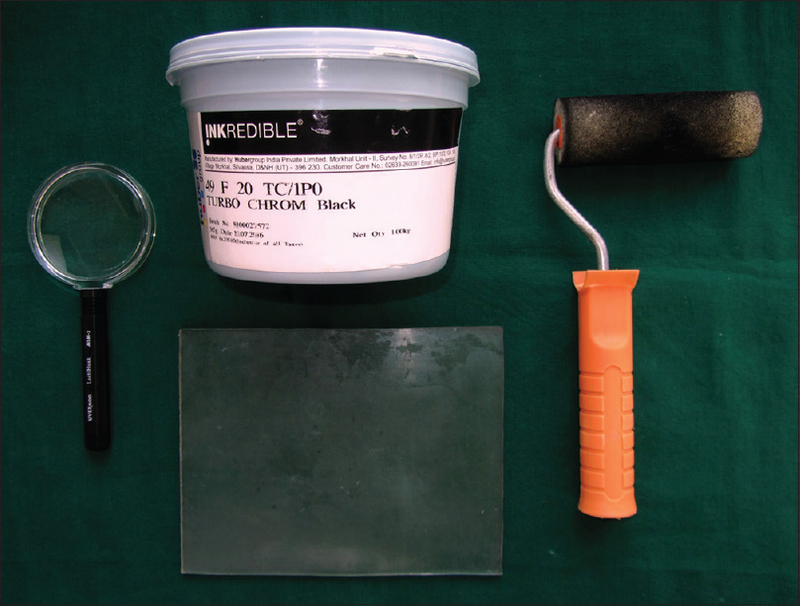 Dermatoglyphic prints were collected by ink method (Inkredible Turbo Chrome Black; Hubergroup India Pvt. Ltd.) which included finger and palm prints. Rolled prints of each finger and palm were taken from each participant using ink method in which the digits and palms were inked by rolling them across the roller onto which black ink is coated. A sheet of paper is placed on top of a foam rubber pad on a flat, stable surface. The foam pad was used to feel the concavity of the palm. Then, the wrist was placed on to the bottom of the paper, and the rest of the palm and digits were pressed on to the paper [Figure 1]. Handprints were labeled by the side (right and left) and abbreviations were given to each finger (thumb – T, index finger – I, middle finger – M, ring finger – R, and little finger – L) [Figure 2]. 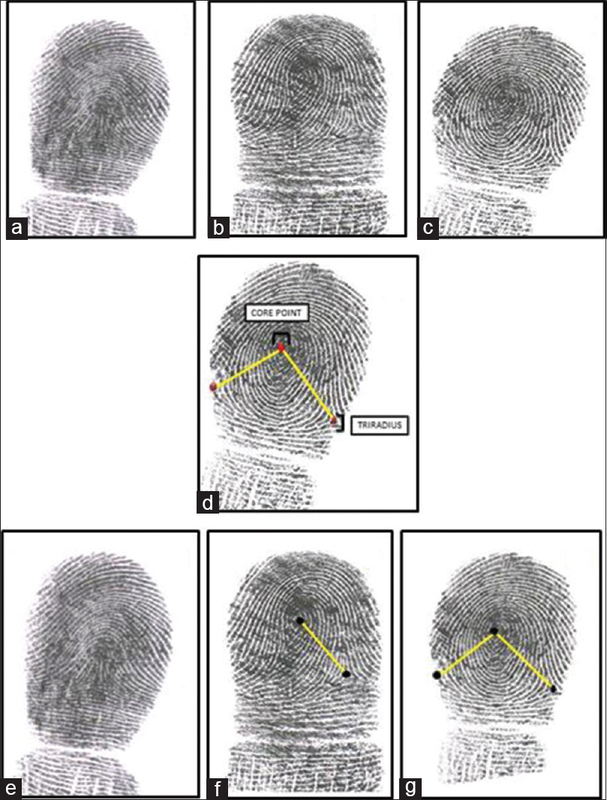 Fingerprints were evaluated for pattern types and total ridge counts (TRCs). One of the three patterns was identified on each fingertip, namely, Arch (A), Loop (L), and Whorl (W). The categories were after Cummins and Midlo  [Figure 3]a, [Figure 3]b, [Figure 3]c.
TRCs were calculated by drawing straight lines between the center of a fingerprint pattern (core point) and the corresponding triradius [Figure 3]d. The term triradius refers to the area or the point that is surrounded by three different directional ridges, the angles of which are about 120°. Arch has no triradius and belonged to the simplest pattern; the TRC of the arch is 0. The loop has one triradius and one core point, the total number of ridges between these two points has to be taken into consideration. The whorl has two triradii and one core point, the larger of which has to be taken into account [Figure 3]e, [Figure 3]f, [Figure 3]g.
Palm prints were evaluated for a-b ridge count and ATD angle. There are 5 triradii on each palm, 4 of which will be located on the distal palm just inferior to the 2nd, 3rd, 4th, and 5th fingers and were named as a, b, c, and d triradii, respectively. The remaining one will be t triradii, the location of which varied on the proximal palm at the junction of thenar and hypothenar areas [Figure 4]A.
a-b ridge counts were captured by drawing straight lines between a and b triradii and counting the ridges that cut through them [Figure 4]B.
ATD angle is measured by capturing the relative position of three triradii (a, t, d), by drawing two straight lines through a and t and d and t [Figure 4]C.
All the measurements and counts were independently assessed and were randomly cross-verified by the trained investigators who were blind to the study. Asymmetry of pattern types was determined by calculating the dissimilarity scores. These scores were calculated by assigning “0” when the fingerprint type was identical for the same digit on the right and left hands and “1” when the fingerprint the patterns were different. Finally, the scores over all five pairs of digits were summed. For each individual, the dissimilarity scores can range from 0 to 5. Except the score of 0, rest all were considered as asymmetrical. Asymmetry of TRC, a-b ridge count, and ATD angles between right and left hands are determined by subtracting the values of the right hand from the left hand in each group. Pattern types, TRC, a-b ridge count, and ATD angles were measured on both hands of all groups and comparisons of each entity were done between Groups AM and BM, AF and BF, and AM and AF. The obtained values are formulated on Excel sheet and are sent for statistical analysis using IBM® SPSS 20 (software package for statistical analysis). As the pattern type represents the qualitative data chi-square test was performed to test the significance between the groups. Whereas TRC, a-b ridge count and ATD angle asymmetry score being quantitative data, independent t-test was performed. [Table 1] depicted the mean values of TRC, a-b ridge count, and ATD angle. There was a significant increase in TRC, a-b ridge count of both the hands in the study group when compared to their respective controls, whereas ATD angle showed significant increase with respect to the values of the right hand. [Table 2] illustrated the presence/absence of t point. A total of 28 cases in Group AM exhibited the absence of t point. Out of these, 22 exhibited the absence of t point either in the right or left hand and 6 cases showed the absence of t point in both the hands and the difference obtained was statistically highly significant. 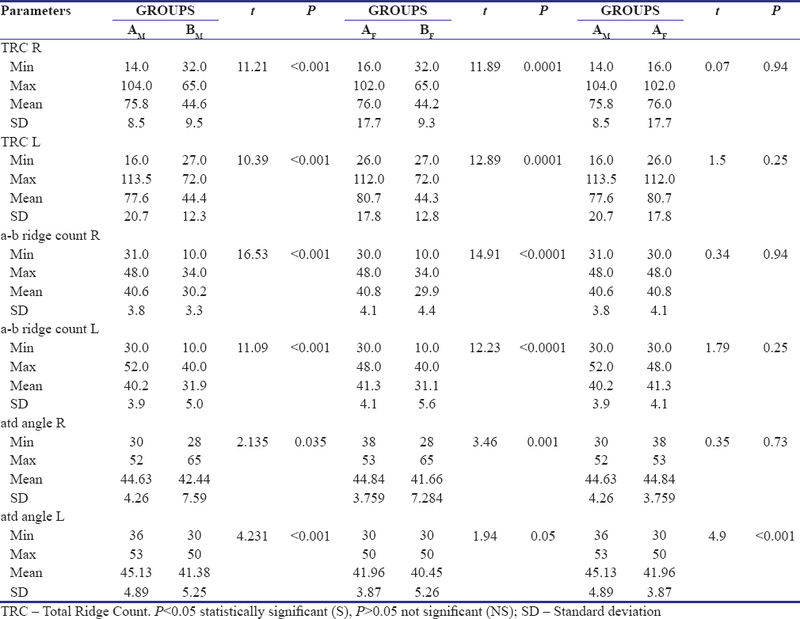 Significant increase in asymmetry of pattern types in both male and female samples of the study group was represented in [Table 3]. [Table 4] showed asymmetry values of TRC, a-b ridge count, and ATD angle. Significant asymmetry was detected in TRC of AF when compared to BF, AM showed significant asymmetry in a-b ridge count and ATD angle. Clefts can be broadly classified into syndromic and NSCL/P. About 70% of CL/P and 50% of isolated cleft palate cases lack additional features and are categorized as “Nonsyndromic.” It was found that the prevalence of NSCL/P varies with ancestry and most commonly affected ones were Asian/Amerindian descendants., Hence, this particular craniofacial anomaly has been selected for the study. All the physical traits are genetically controlled and are passed from one generation to the other which is governed by laws of inheritance propounded of Mendel and the features of dermatoglyphics and cleft deformities are not an exception. Threshold theory which was put forth by Carter and Wilkinson stated that abnormalities are the result of both genetic and environmental factors, but expressed only after exceeding threshold limit. According to this statement, before they could be physically expressed, there is an inevitable chance for few variations to occur in dermatoglyphics due to their correlated formation at intrauterine life. So as an attempt to derive the proportion and intensity of these genetic variations with reference to NSCL/P in the previous generations, the present study was planned with unaffected parents of cleft progeny. The pattern types can easily be detected on the fingertips and any variations can be easily determined. Hence, pattern types were included in the study. Most frequently obtained pattern was loop in the present study. In similar studies conducted by Jahanbin et al. and Saxena et al. showed that the loop pattern was frequently seen in the normal individuals. Verbov (1970) stated that loops are the most common pattern types and represent about 70% of all finger patterns in Britain. In the present study, there was statistically significant difference seen between individual pattern types, where loops being more frequently seen, next being whorls, and finally the arches in all the four groups. This indicates the overall genetic predilection for loop pattern. In contrary to the present study, studies conducted by Woolf and Gianas , and Jahanbin et al. found that fathers of cleft patients had an increased frequency of arches. But in the present study, such difference has not been established. Literature has shown that in the instances of genetic abnormality, there will be variation in the TRC. Hence, this particular entity has been included in the present study. There was significant increase in the mean TRC in both the groups of study population with reference to their respective controls. In contrast to these observations, Saxena et al. reported decreased mean TRC of parents with cleft progeny when compared to their controls. Furthermore, in a study conducted by Ma et al., it was shown that there was no significant difference witnessed between the parents with CL/P children and control parents. The probable reason for reported dissimilarity might be that they reported increased occurrence of arch patterns in the parents with cleft children. Along with the increase in TRC a wide range between the minimum and maximum values of TRC in study group was expressively observed [Table 1]. This typically signifies developmental alteration during the formation of ridges in the parents of affected children. The interdigital area between forefinger and middle finger said to be exposed to intrauterine environmental pressures for a greater period than other parts of palm. Hence, there are many chances for variations to occur in this area, so a-b ridge count was selected for the study. The mean a-b ridge count of controls was in the normal range of 10 and 40. It was found that there was a significant increase in the mean a-b ridge in cases where the minimum values were at the upper limit of the normal range and the maximum values were beyond the normal range (31–52), similar findings have been reported by Ma et al. and concluded that this could be a good index for predicting the future risk of CL/P which is also an inheritable palmar trait. The reliability of ATD angle was proved by Brunson et al. saying that the ATD angle can be measured reliably whether the readings are made by one individual or multiple readers. Hence, the ATD angle was selected for the study. The normal ATD angle ranged between 30° and 65°. With regard to this, all selected individuals showed minimum and maximum values in the stated normal range, but there were increased mean scores in both the hands of study group when compared to those of controls and this difference was statistically significant. The overall increase in the ATD angle can be attributed to the fact that t triradius point [Figure 4]A was more distally placed which led to the increase in angle in parents with cleft children. In contrary, decrease in mean ATD angle was reported by Jahanbin et al. and Saxena et al., but significant difference was reported only with the right hand by Saxena et al. Ma et al. did not notice any significant difference. Another remarkable finding seen in the present study was the absence of t point in unaffected mothers of cleft progeny. Among the total sample of 100, 28 exhibited the absence of t point. Out of these, 22 exhibited the absence of t point either in the right or left hand and 6 cases showed the absence of t point in both the hands and the difference obtained was highly significant (p 0.002). Genes in their optimal state are nearly symmetrical. Asymmetry will be illustrated in various human bilateral structures such as orofacial structures and hands depending on alteration in genetic expression. Genetic damage takes place in phylogenic horizon in cleft which can be reflected in hands through dermatoglyphic asymmetry. It was evidently observed in the present study that there was increased asymmetry in the pattern types of both the parents with cleft progeny when compared to their respective controls [Table 3]. In a similar study conducted by Jahanbin et al. reported that only female cases differed significantly from controls and there was no significant difference between male cases and controls. 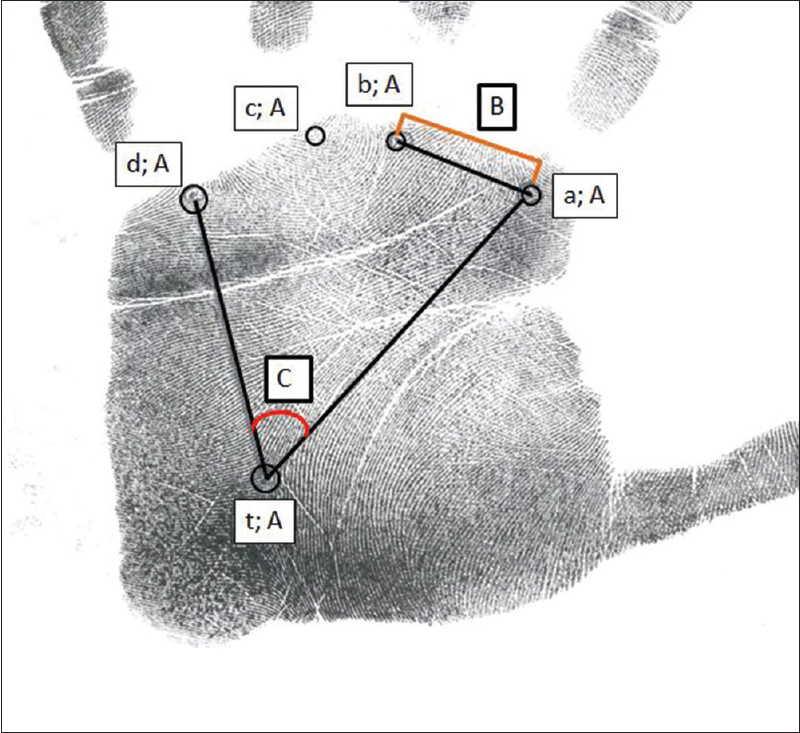 The increased asymmetry in pattern types on 2nd, 3rd, and 4th fingers when compared to their respective controls was reported in a study piloted by Ma et al. 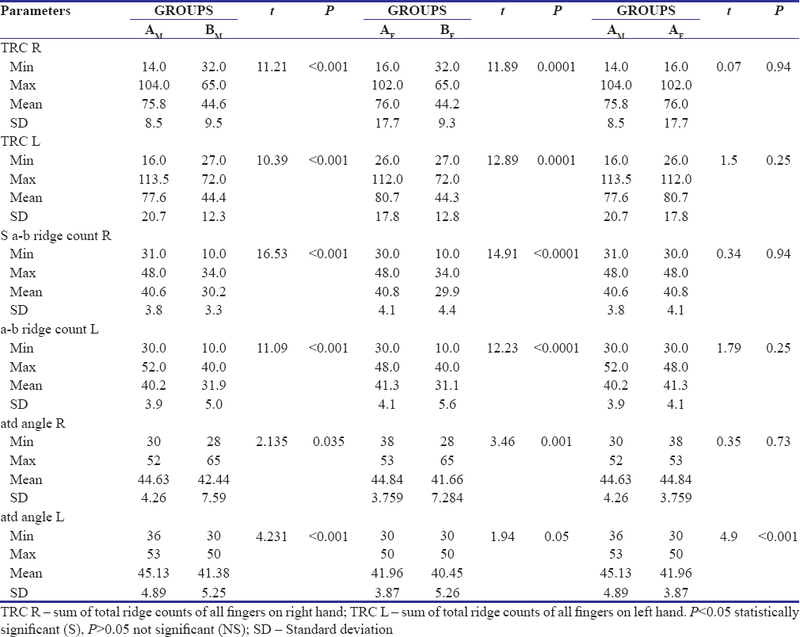 When the asymmetry of TRC, a-b ridge count, and ATD angle were compared between parents of cleft children and their controls, fathers in Group A showed increased asymmetry in TRC and mothers in Group A showed increased asymmetry in a-b ridge count and ATD angle [Table 4]. Jahanbin et al. found that the asymmetry of ATD angle of cases differed significantly from the scores of controls which were in accordance with the present study. In a study conducted by Ma et al., there was no significant difference seen in the asymmetry of a-b ridge count and ATD angle between cases and control groups which was in contrary to the present study. Presence of few minor variations in dermatoglyphic patterns may not always be associated with the risk of having genetic abnormalities in the future generations, but the presence of marked disparities in these patterns could be a predictable indicator for determining the genetic aberration risk in the future generations. Further studies should be planned by considering these variations as standard predictable risk indicators and by calculating the risk probability. Determining the cross inheritance by studying the children dermatoglyphic patterns and relating them to the asymmetry of parents might aid in the better analysis. Prospective studies would be valuable for the establishment of dermatoglyphic markers of the cleft. Dermatoglyphics, in turn, can be immensely helpful for the easy, accessible, noninvasive, and economical identification of groups at high risk of developing cleft and for timely prevention, especially in developing countries with enormous populations and limited health budgets. Irrespective of the groups, most commonly found pattern was loop. The mean TRC, a-b ridge count, and values of ATD angle were significantly increased in the study group. Absence of t point and presence of asymmetry in the studied parameters were typically associated with study population, none of the controls exhibited these features. Thus, it may be concluded that dermatoglyphics can be used as tool to study the DI of cleft anomalies and provide data to assess the individual variations, familial correlations, as well to know the genetic etiology of clefting. At this juncture, from the findings of this study (even though the observations may not be authenticative), it proves that the particular type of dermatoglyphic variation has always been associated with specific genetic alteration. However, this study has definitely proved the usefulness of dermatoglyphics in analyzing altered genetic patterns. Cummins H, Midlo C. Palmar and plantar epidermal ridge configurations in European Americans. Am J Phys Anthrop 1926;9:471-502. Prabhu N, Issrani R, Mathur S, Mishra G. Dermatoglyphics in health and oral diseases – A review. JSM Dent 2014;2:1-5. Anitha C, Konde S, Raj NS, Kumar NC, Peethamber P. Dermatoglyphics: A genetic marker of early childhood caries. J Indian Soc Pedod Prev Dent 2014;32:220-4. Trehan M, Kapoor DN, Tandon P, Sharma VP. A correlative study of dermatoglyphic pattern with malocclusion. J Ind Orthod Soc 2001;34:114-25. Sengupta AB, Bazmi BA, Sarkar S, Kar S, Ghosh C, Mubtasum H, et al. A cross-sectional study of dermatoglyphics and dental caries in Bengalee children. J Indian Soc Pedod Prev Dent 2013;31:245-8. Neiswanger K, Cooper ME, Liu YE, Hu DN, Melnick M, Weinberg SM, et al. Bilateral asymmetry in Chinese families with cleft lip with or without cleft palate. Cleft Palate Craniofac J 2005;42:192-6. Dean JA, Avery DR, McDonald RE. Non penetrance of genes. McDonald and Avery's Dentistry for the Child and Adolescent. 9th ed. Missouri Mosby Elsevier 2014; p. 80. Beiraghi S, Nath SK, Gaines M, Mandhyan DD, Hutchings D, Ratnamala U, et al. Autosomal dominant nonsyndromic cleft lip and palate: Significant evidence of linkage at 18q21.1. Am J Hum Genet 2007;81:180-8. Scott NM, Weinberg SM, Neiswanger K, Daack-Hirsch S, O'Brien S, Murray JC, et al. Dermatoglyphic pattern types in subjects with nonsyndromic cleft lip with or without cleft palate (CL/P) and their unaffected relatives in the Philippines. Cleft Palate Craniofac J 2005;42:362-6. Jahanbin A, Mahdavishahri N, Naseri MM, Sardari Y, Rezaian S. Dermatoglyphic analysis in parents with nonfamilial bilateral cleft lip and palate children. Cleft Palate Craniofac J 2010;47:9-14. Burg ML, Chai Y, Yao CA, Magee W 3rd, Figueiredo JC. Epidemiology, etiology, and treatment of isolated cleft palate. Front Physiol 2016;7:67. Lakhanpal M, Gupta N, Rao NC, Vashisth S. Genetics of cleft lip and palate – Is it still patchy? JSM Dent 2014;2:1-4. Miller SF, Weinberg SM, Nidey NL, Defay DK, Marazita ML, Wehby GL, et al. Exploratory genotype-phenotype correlations of facial form and asymmetry in unaffected relatives of children with non-syndromic cleft lip and/or palate. J Anat 2014;224:688-709. Nasser LS, Martelli DR, Serts MS, Popoff DA, Barros LM, Junior HM. Opthalmic changes in cleft lip and palate. Rev Bras Oftalmol 2016;75:94-8. Abhilash PR, Divyashree R, Patil SG, Gupta M, Chandrasekar T, Karthikeyan R, et al. Dermatoglyphics in patients with dental caries: A study on 1250 individuals. J Contemp Dent Pract 2012;13:266-74. Carter CO, Wilkinson JA. Genetic and environmental factors in the etiology of congenital dislocation of the hip. Clin Orthop Relat Res 1964;33:119-28. Mulvihill JJ, Smith DW. The genesis of dermatoglyphics. J Pediatr 1969;75:579-89. Verbov J. Clinical significance and genetics of epidermal ridges – A review of dermatoglyphics. J Invest Dermatol 1970;54:261-71. Woolf CM, Gianas AD. Congenital cleft lip and fluctuating dermatoglyphic asymmetry. Am J Hum Genet 1976;28:400-3. Woolf CM, Gianas AD. A study of fluctuating dermatoglyphic asymmetry in the sibs and parents of cleft lip propositi. Am J Hum Genet 1977;29:503-7. Ma H, Qiu Y, Zhu W, Chao H, Shi B. Dermatoglyphic features in nonsyndromic cleft lip and/or palate patients and their parents in China. Cleft Palate Craniofac J 2014;51:76-82. Arrieta MI, Criado B, Martinez B, Lobato MN, Gil A, Lostao CM, et al. Fluctuating dermatoglyphic asymmetry: Genetic and prenatal influences. Ann Hum Biol 1993;20:557-63. Brunson EK, Hohnan DJ, Giovas CM. Reliability of the ATD angle in dermatoglyphic analysis. Coll Antropol 2015;39:797-800. Vashist M, Yadav R, Neelkamal, Kumar A. Axial triradius as a preliminary diagnostic tool in patients of mental retardation. Internet J Biol Anthropol 2009;4:1-5.